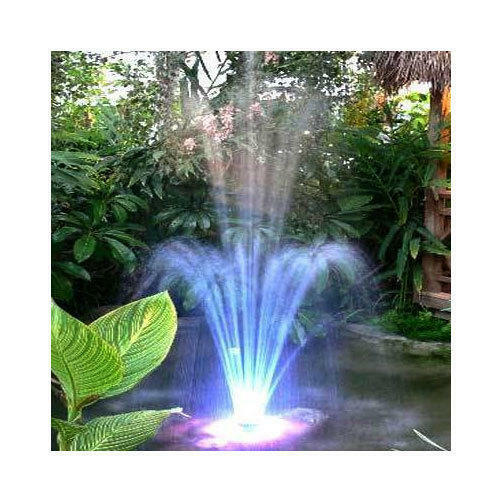 Our proficiency enables us to offer a comprehensive assortment of Three Stage Floating Fountains to our clients. Imparting natural look and creativity to various residential and commercial gardens, these fountains are widely acknowledged for their strength and designs.Design, Supply, Erection, Testing and Commissioning of Royal – Three Stage Jet Floating Fountain consists of a floating body made up of virgin quality fibre, three stage jet unit made up of brass with nickel plating, necessary Openwell submersible monoblock water-cooled pump, multi colour L.E.D lights made up of stainless steel, sealed with heat resistant, toughened glass provided with mounting cradle with necessary UPVC pipes, fittings & control valves, panel board for pump consisting of isolated switch, phase lights, start and stop push buttons, contactor, relay, volt meter, ammeter in a powder coated mild steel enclosures etc, complete. We "Royal Fountains & Equipments" are engaged in manufacturing, importing and exporting a high-quality assortment of Water Curtain, Water Fountain, etc. We are a Sole Proprietorship company that is established in the year 1997 at Coimbatore, Tamil Nadu and are connected with the renowned vendors of the market who assist us to provide a qualitative range of products as per the global set standards. Under the supervision of "Mr. Saravanan Selladurai", we have attained a dynamic position in this sector.